I keep expecting life to slow down, and it never happens. Am I the only one who feels this way? I'm always saying to myself, "Okay, this weekend, we don't have anything planned, so I'm going to [insert hobby here]." But something always comes up. Activities with the kids, visiting family, cleaning the house, school projects, etc. It's always something. Fortunately, I have hobbies that can be done during little bits of stolen time between other activities. Sometimes even DURING other activities. Basketball game? I can knit in the stands. Parent meeting for the marching band trip? I can knit something simple while still paying attention. Cleaning the house? I can bake bread and take little breaks from cleaning when it's time to knead or divide the dough or whatever. A couple of weekends ago, I went on a bread-making frenzy. I made five loaves of bread. One long-rise no-knead bread that is absolutely delicious! 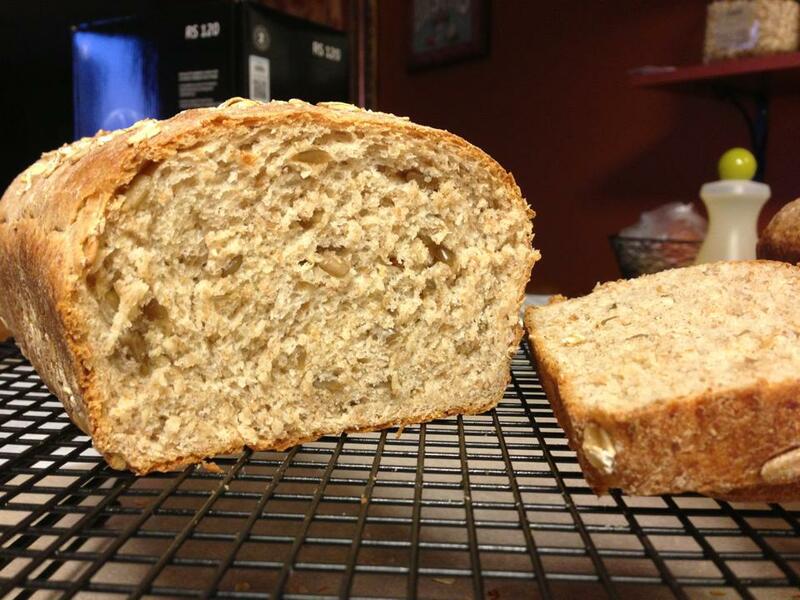 And four loaves of multi-grain whole-grain bread that requires a bit more attention. So good! And so easy! Excellent warm from the oven, slathered with real butter. Also, it makes an amazing grilled cheese sandwich. My husband, who isn't really a "bread" person, even loved it! This is the kind of bread that, even though you have to start putting it together the day before, really requires very little work. Next, four loaves of the multi-grain whole-grain bread. This bread is also really yummy. It starts with a multi-grain hot cereal, is sweetened with honey, and offers options for the addition of sunflower or pumpkin seeds. I couldn't find the 7-grain cereal called for, so I used a 5-grain rolled hot cereal mix. I've since discovered a source for the 7-grain cereal, which isn't rolled, and I can't wait to try it! If you look closely at the bottom picture, you can see that I added sunflower seeds. I like this bread toasted with butter and cinnamon or jam. It also makes a good sandwich if you slice it thin enough. Yum! 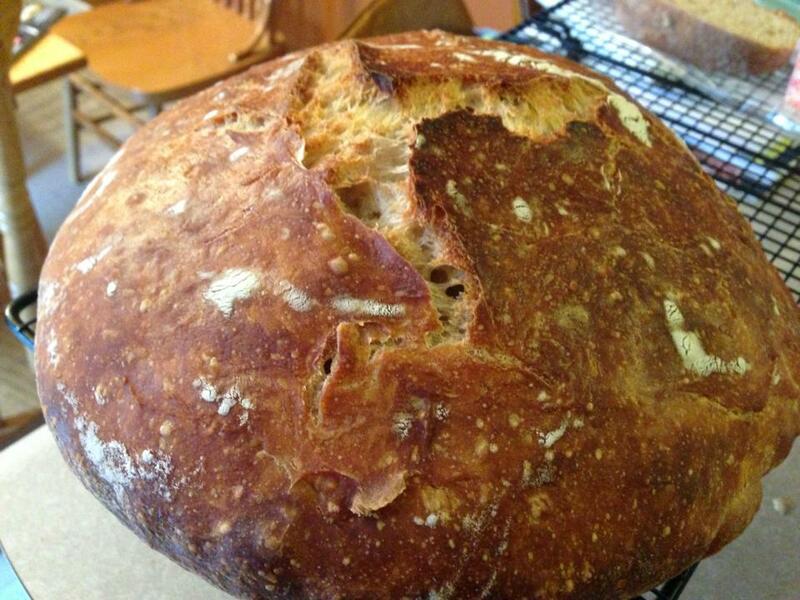 As good as this bread is, it really requires quite a bit of work. Soaking the cereal, mixing the dough, letting it rest, adding the salt, resting again, adding the seeds. let it rise, divide into pans, let it rise again, then bake. But, it's totally worth it. I just set the timer on my phone to remind me when to go back and do the next step. I'm hoping to mix up a couple of batches of this soon so I can freeze the dough for future use, for those days when I don't have time to do all the fiddly bits. I'm planning to line it with black fabric, and I think I got enough to make a tote for Tori, who plays flute in the band. Maybe I'll even ask Aaron if he wants to use this opportunity to learn how to sew. He's on spring break next week, so that might be a great activity for one day.